Thoughts and ideas from the world of Majestic Mountain Sage. Last week I shared my experiences at the local Gardener’s Market as well as my thoughts that officially felt like growing season now. I’ve been pulling weeds out of the garden and arguing with chickens over the spots they can dig. 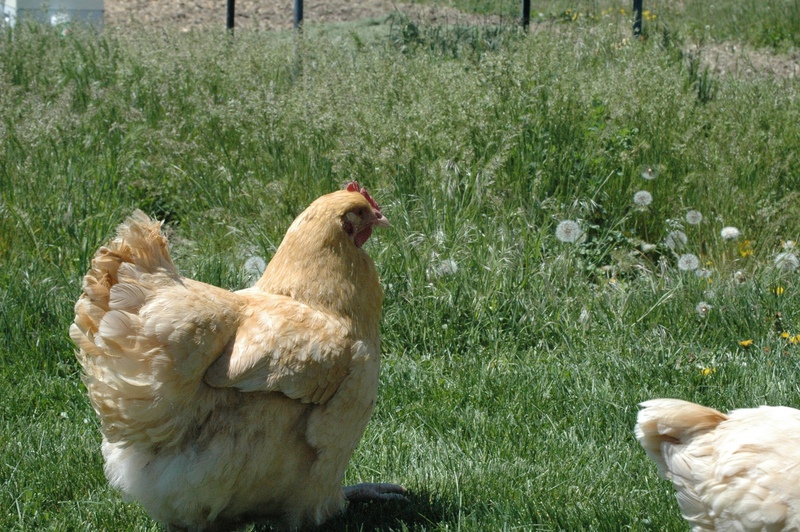 Not that the chickens argue back, they just tilt their heads and look at me like I’m crazy for pushing them out of the freshly tilled soil. Maybe I am, but I like eating fresh vegetables and chickens digging up my newly planted seeds are not on my list of fresh vegetable enjoyment. These silly girls are so funny! Unfortunately, I despise gardening while wearing gloves and if I’m not careful, the weeds shred my hands. Digging around in the dirt pulls all the moisture away from my skin and then since my hands are dry, they can crack and bleed. That just makes the gardening not fun anymore! This recipe was formulated for those of us that spend our evenings and weekends out in the garden, but anyone with dry skin could benefit from this great hand therapy butter. I love the Gardener’s Hand Therapy and I believe anyone can find a use for it. 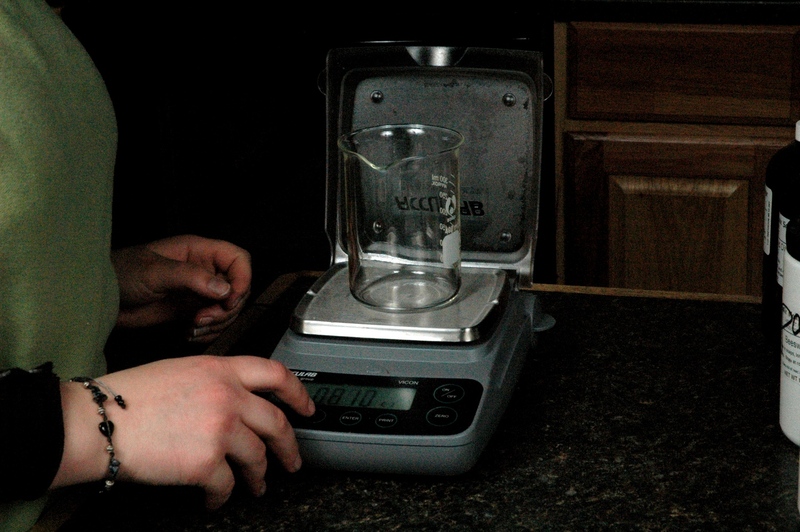 Weigh everything except the essential oil into the beaker. Melt, using the microwave in short bursts until everything is mostly melted. Once you have reached this point, you can add the Bourbon Geranium Essential Oil and stir well with a transfer pipette until all ingredients have been completely melted. This recipe is great in the lip balm jars for small portable use. This recipe also can be used for the lips, but I would recommend that you use a flavor or essential oil that will be work with your lips. Next week is Hot Process Soap Week! 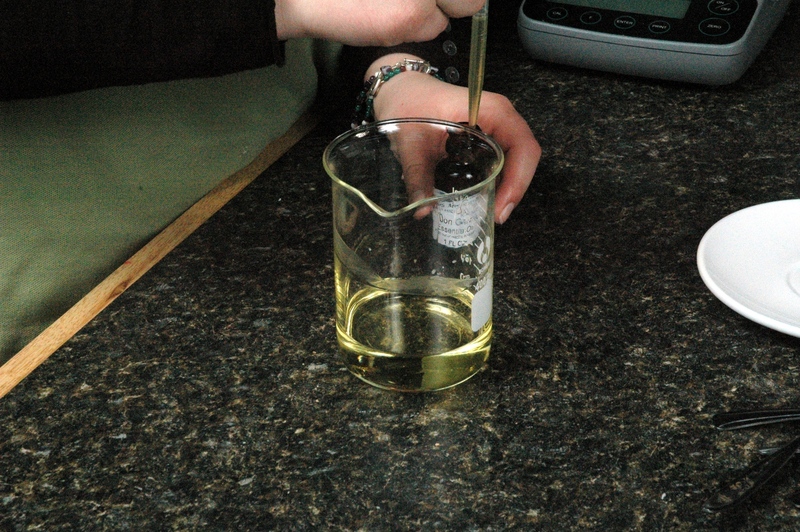 Adding Bourbon Geranium Essential to melted oils. 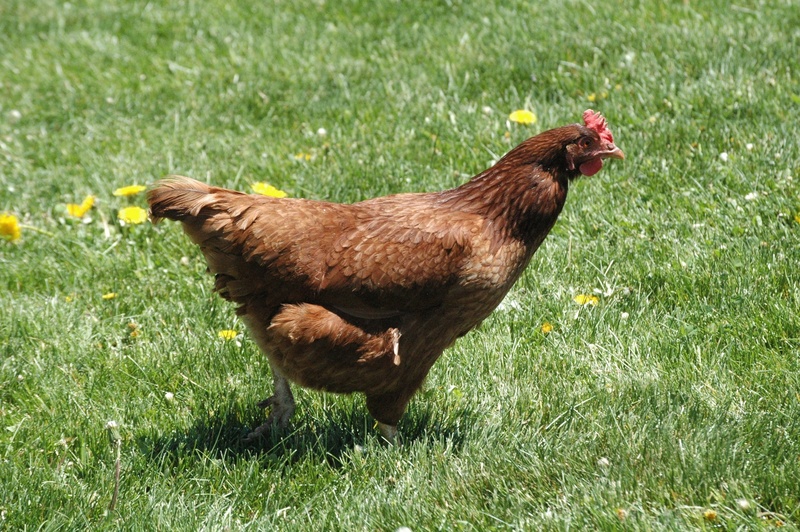 Another chicken crossing the yard. I'm a thirty-something soap snob. I've grown up with handmade soaps, and I love them! 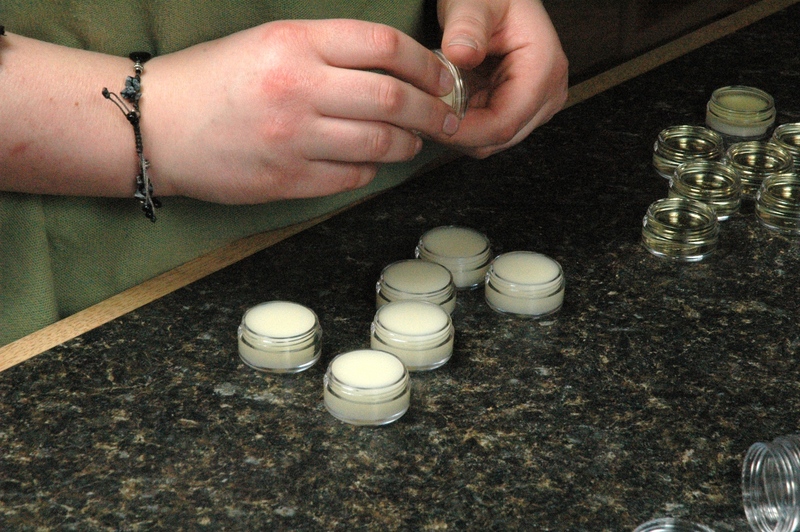 I really like making lotions, soaps, and perfumes. I adore mixing scents to come up with something new. My favorite scent is either Wicked or Cotton Candy. I tend to hoard fragrances, I even have an Earl Grey Tea from the MMS catalog. I won't tell you how old it is, but it sure is good! Beautiful birds! They look like they have had plentyof bugs (and seeds) to eat! They also dig in the grass clippings from mowing the lawn for bugs, and they like to jump into our compost bin and dig through that to find food that we have composted. They love various cooked hot cereals such as oatmeal, grits, barley, and rice. They also like cottage cheese, ricotta, spinach, lettuce, bread or toast, pancakes or waffles, shredded apples and carrots, and any other vegetables that we eat. We have very spoiled chickens! They get any leftovers from our meals that we don’t plan on keeping for leftovers. I feed them some scratch (cracked corn, cut oats, and cracked rye) every morning and they eat that quickly! They keep our bugs down to a minimum and they even chase the neighbor’s cats out of the yard! We can always tell, because the neighbor’s cats are missing fur from their tails! I have this lotion I got a while back from a friend and I love it! Sadly I cannot find it anywhere so I would really like to make my own version…only I am new to making soaps and lotions so I don’t know where to start. It’s a cucumber foot cream. I love it so much I use it on my leg and arms too. And it’s almost gone! My question, any suggestions for a basic mix of these ingredients? Or even a starting direction I should go in? Any advice would really help! This is tough with only an ingredient listing. There are some things you can try, but without knowing what the final outcome is like, it is hard to make beginning guesses. 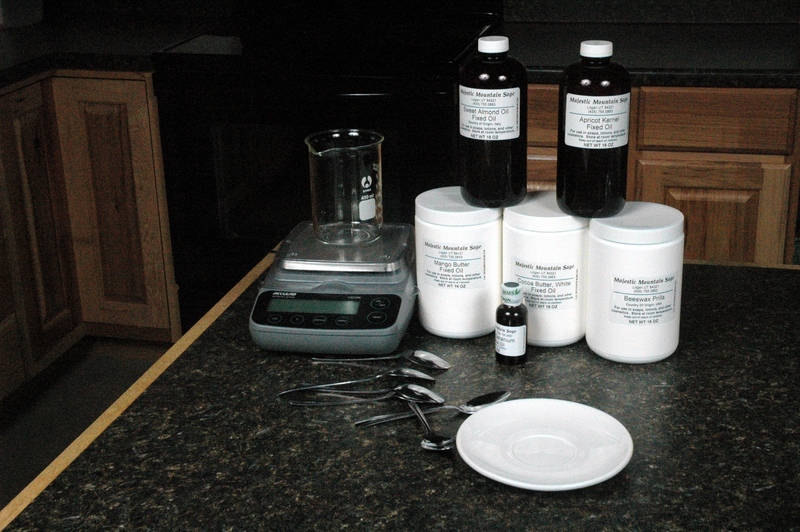 If you are willing to do some testing, I can give you starting formulations, but you will have to test and compare, then describe the difference. If this is nowhere near the consistency, we may need to consider that these ingredients may be out of order. Hi again, it seems the first batch was a miss. So after trying it and coming back on here I realized that this may indeed be mixed up or I am just an amature at this still LOL. Sooo I went through my friends bathroom and came across another bottle. And the ingredients are in a different order! I looks newer than mine too. Hummm. So I was wondering if perhaps this new list made more sence and if you could possibly give me another starting formulation. I am soo hopeful to make more of this. I would just bathe in it if I could lol! Please tell me what you got from the first batch, and how it varies from the product you are trying to duplicate. 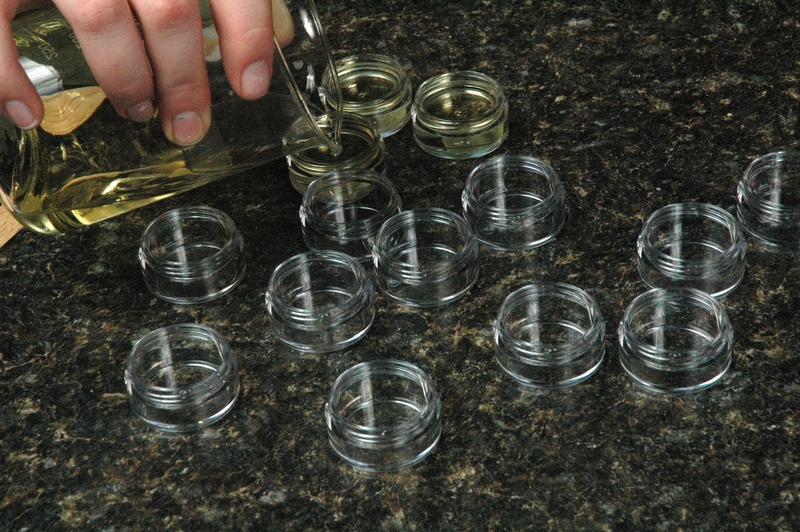 If we can’t get closer by our third try, would you be willing to send us a 1/4 oz jar sample? 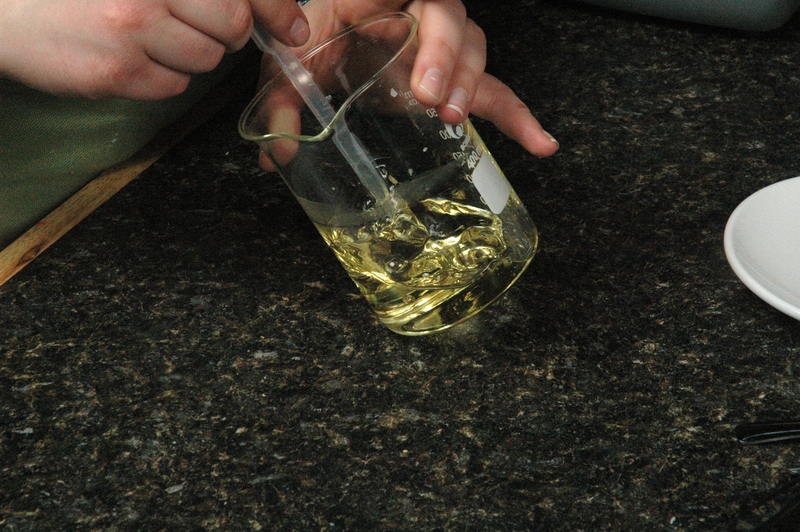 The beginning percentages were given due to position of the emulsifying wax. The others are entire guesses. Mine seems kinda greasy. The real thing was much different creamier and rubs in smoother. Perhaps I’m just reading percentages wrong. I’m not great with percentages yet. Maybe I should try it again. Then if this is a miss I could send in a sample of both. Do you have a suggestion on a small two jar batch in ounces? Sorry all the questions. If you can, keep the percentages to metrics and each single percentage being a single gram. This will make a less than 4 fl oz test batch and you can easily get an idea of what the lotion will do. I am new to diy lotion making. Your recipe seemed easy. 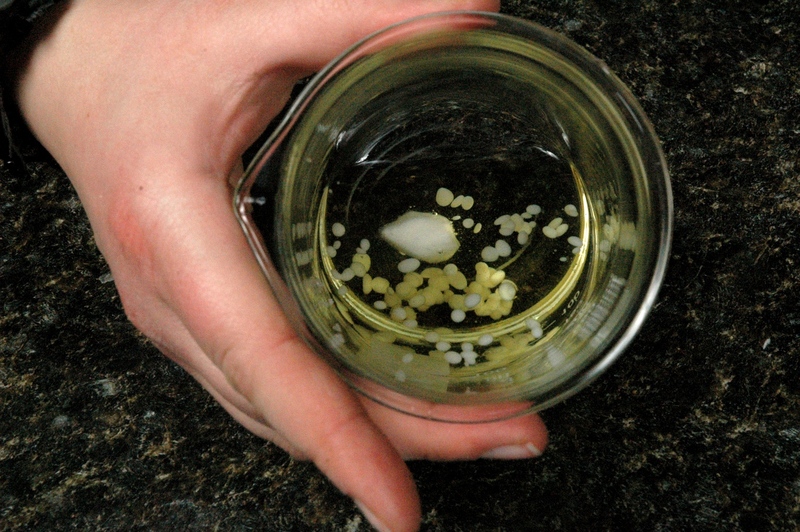 We don’t need a preservative nor Emulsifying wax to make it last longer. Any comments are appreciated. 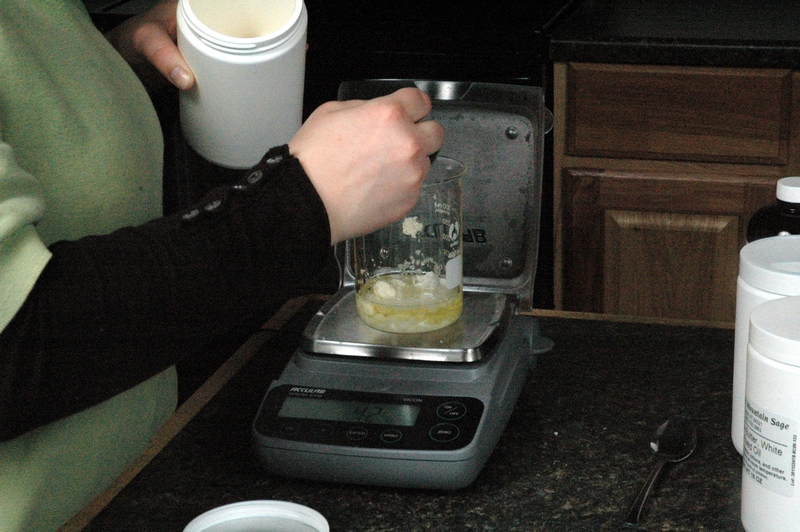 This is a great salve type recipe and is super easy to make. I like to have this on hand during the summer gardening season and it works wonders on my hands.